Some people feel self-conscious about smiling because they believe their gums are too prominent. Though we each have our own definition of what makes a smile beautiful — including how much gum is too much — a smile will usually be perceived as “gummy” when 4 millimeters (just over an eighth of an inch) of gum tissue shows. If your smile looks gummy to you, it's important to figure out exactly what's causing this. Only then can the appropriate cosmetic dental or periodontal (gum) procedures be recommended to give you a more pleasing appearance of the gums and teeth. Gums. If your teeth appear too short in relation to your gums, it could be that they are being covered up by too much gum tissue. This problem can be solved with a periodontal plastic surgery technique called “crown lengthening,” which involves removing and reshaping the excess tissue to expose the full length of teeth. Teeth. There are natural variations in the tooth-eruption process that can result in shorter than normal teeth and gumminess of the smile. If that's the case, your teeth can be made to appear longer by capping (crowning) them or covering them with thin porcelain veneers. It's also possible that your teeth have become worn down over time, especially if you have a grinding habit. When this happens, it can cause what is known as compensatory eruption. To compensate for the wear and maintain a functional bite, the teeth actually begin to move (or erupt) very slowly outward from the gum. 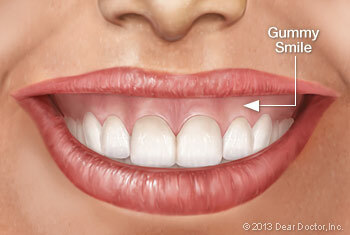 This makes the smile appear gummier because the gums, which are attached to the teeth, move with them as they erupt. In some cases orthodontic treatment can be used to move the affected teeth back up into correct position. Afterwards, the worn-down teeth would usually be restored with porcelain crowns or veneers. Lip. On average, the upper lip moves 6 to 8 millimeters from its normal resting position to a full smile. If the lip is hypermobile, meaning it rises much farther up, more gum tissue will be revealed. Here the action of the muscles that control the lip will need to be modified so they don't raise it quite so high. Treatment can range from Botox shots that temporarily paralyze the muscles (for about six months), to surgery that permanently restricts how high the lip can move, referred to as a lip stabilization procedure. Jaw. Sometimes the upper jaw (maxilla) is too long for the face, a condition referred to as Vertical Maxillary Excess. If this is the case, the jaw would need to be repositioned with orthognathic surgery (“ortho” – straighten; “gnathos” – jaw). Of all the treatment listed here, this one is the most complex — but it can achieve dramatic results. As you can see, there is no one-size-fits-all approach to correcting a gummy smile. However, there are various techniques that can achieve dramatic improvements.